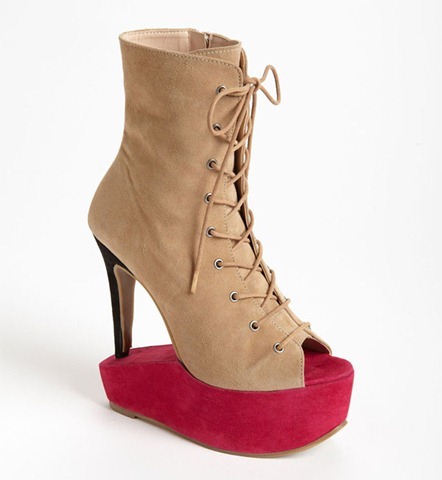 The Gazelle Boot from DV8 Dolce Vita is an odd combination of a standard lace up boot, a peep toe pump, and an inverted hot pink wedge. I think it is rather ugly. But someone must love it? What do you think? If you really want it, you can get the Gazelle boot at Nordstrom. I love the Luichiny Zen A Doo! This is a mid calf boot with faux fur, rather interesting decorative cross straps, and tan accents. It all rests on a 1 inch platform with a 4 1/2 inch heel. traction added to the bottom prevents slipping, and the heel is sturdy. Mostly, I really love the look of it!